Reputationally, a visit to Paris is rife with rudeness: the maitre d’hotel looking askance at you over the rooftops of his European-sourced eyeglasses, the apron-bedecked waiter ignoring your pleas for service, the elderly, compression-stockinged resident, baguette clenched firmly in hand, contemptuously turning her back as you ask for directions. The reputation is inaccurate. Paris is both majestic and lovely, its people absolutely wonderful and the food and its preparation – incomparable. All Jacquelyn and I can do is urge you to visit, unhurriedly, lingeringly, pacing yourself at a comfortable walk, and, when you eventually do go home, that you make plans to visit again. Like John Lennon and Yoko Ono before us,several years ago, Jacquelyn and I set our sights on Paris. We had arrived on a Saturday in April, after a long night flight, passing high over Newfoundland, the southern coast of Greenland, Iceland’s coastline winking at us just over the earth’s northern horizon, across Ireland, England and the English Channel. We arrived in Paris at 8:00 in the morning and, neither of us having been to Paris in a considerable length of time, we had our hotel pick us up by car. While on the plane, we had anticipated arriving, exhausted by the night flight, not looking forward to that first day, wandering the city aimlessly, waiting for our room to be ready by 3:00. But after a short, unusually pleasant, and completely unsolicited tour of the Paris monuments by our driver, escorting us like royalty through the City in a Jaguar XJ, we arrived at the Hotel Pont Royal. Mere blocks from the Seine, across which is the Musee du Louvre, the Hotel Pont Royal was at once welcoming. Small, charming in a boutique kind of way, the Pont Royal is located in St-Germain-des-Prés, on la Rive Gauche, in the Latin Quarter. The hotel has been a small, unassuming stalwart at 7 Rue Montalembert since 1815. Previously a residence, the Pont Royal is intimate but rich, bathed in dark woods and plush fabrics. Hemingway was once there, drinking and writing at the bar; as were the Fitzgeralds and Henry Miller, John-Paul Sartre and Simone De Beauvoir, Albert Camus and Gabriel Garcia Marquez. Indeed, the Pont Royal overflows with the ghosts of writers; it is “un Hotel Litteraire.” And while admittedly, since Louis Vuitton opened next to Les Deux Magots, the image of a struggling ex-pat like Ernest Hemingway, writing feverishly in a Parisian garret might be the stuff of a Paris now long gone, if you close your eyes tight, the ghosts of the Hotel Litterarie still seem to nevertheless inhabit the Hotel Pont Royal. Our bags were quickly corralled and we were greeted by Julie, who after some preliminaries, advised us that our room, incredibly, was ready. Julie smilingly escorted us to the tiny elevator at the far end of the lobby and then to our room on the fifth floor. Our room, like the lobby, was lathered in dark wood but this time juxtaposed by bright white linens. Our bed, overflowing in comforters, overlooked the streets of the 7thArrondissement, just down from the Boulevard St. Germain. From our balcony, the uppermost spire of the Tour Eiffel could be glimpsed above the Paris rooftops, the Seine coursing its way west toward Notre Dame. We hurriedly unpacked and began our explorations. While there were some things we simply had to see, Jacquelyn and I had no real agenda. We left the hotel, map in hand offered by Julie as we were on our way out, her remarkable graciousness and her smiling prescience during our stay sometimes startling. We crossed over the Pont Royal, just a block from our hotel of the same name, and circumnavigated the Louvre, picking out those floors of the Louvre where we would have resided had we had the misfortune of being French aristocracy several hundred years earlier. We paused along the Seine, taking in the vendors hawking their panoply of wares, remarking on the similarity of the goods presented from vendor to vendor. We lamented the love locks on the Pont Des Arts, a thoughtful but unfortunate expression of the transient hopes of young love, expressions that have diminished the majesty of that lovely bridge. We learned later that the French government had decided to remove the locks – a welcome decision. We stopped for coffee and then for lunch, making our way slowly toward the Marais district to the Place de Vosges, Victor Hugo’s former residence and an oasis of quiet. We agreed with our guidebook’s descriptions: the facades themselves are nothing short of elegant comprised of red brick with stone quoins over vaulted arcades that run the length of the four sides of the square. The steeply-pitched slate roofs stand like sentinels above the pedimented dormers at the cornices. The north and south facades allow access to the square through triple arches, respectively named the Pavilion of the King and Queen. While French royalty, despite the moniker, has never lived in the Place des Vosges, it has housed such notables as Victor Hugo, author of the Hunchback of Notre Dameand Les Miserablesin No. 6 and in No. 21, Cardinal Richelieu, France’s Secretary of State for foreign affairs in 1616 and its Prime Minister in 1624. We wondered why, in a pique of jealousy, they simply don’t make housing like that anymore. Reluctant to leave, we nevertheless proceeded out through the Pavilion of the King, grabbed an éclair at a shop nearby and soon found ourselves before the Hotel de Sully. Built during the reign of Henry IV, Sully is one of the last remaining private mansions built by the aristocracy during Henry IV’s reign. Despite traffic all around, we had suddenly left the noise of the Marais district’s streets far behind. We continued toward the Bastille, gone now, unfortunately, ripped from its foundations stone by stone during the French Revolution in 1789, commemorated now with a single monument topped with a gilded statue of a winged Mercury carrying the torch of freedom. An unfortunate backdrop to the Bastille is the Opera Bastille, a Carlos Ott designed opera house built – ludicrously – “for the people;” glass, garish and, we thought, grandiosely out of place with its surroundings. But perhaps we were tired. We made our way back and retreated to our room at the Pont Royal. Dinner that first night was at L’Atelier by Joel Robuchon, a two star Michelin restaurant, selected, admittedly, only for its location immediately next to the Hotel Pont Royal. Reservations were hastily arranged by the hotel staff, and as late comers, we sat at the bar and watched the choreography of our food preparation. The food, by executive chef Axel Manes, was expensive, as we had expected, but impressive, almost luxurious. Accompanying our meal were wines, each well-selected by the sommelier. And while the food was wonderful, we agreed that the height of the meal was the dessert: a confection resembling a small, smooth planet surrounded by an atmosphere of pink, gold and gray evanescent clouds, served on a plate with a representation of God’s open palms. Admittedly, tourists that we were, we took a picture. Our waiter, waiting patiently for the completion of our expressions of tourism, then poured a warm, viscous liquid down over and upon our little planet, enveloping it, destroying it, melting it into a delectable, craggy asteroid of cream and chocolate. So we took another picture and, not wanting to wait anymore, dug into our now desiccated, delicious delectable. Nothing more need be said. And by that dessert, and the wine that accompanied our meal and the dessert, we felt as if we had received more than our money’s worth. We awoke on Easter Sunday, dressed in our finest and hand in hand walked the Seine to Notre Dame, Jacquelyn, as the sole Catholic in our little family, wanted, perhaps naively, to attend Sunday mass in this, arguably, the most famous cathedral in the world. Notre Dame was begun in 1163 but construction was not completed until two centuries later when the first mass was held there in 1345. Built on the same place the Romans had built the Temple of Jupiter in 52 B.C., Notre Dame is the center spot, Point Zero, the place, in the Place du Parvis, adjacent to the Statue of Charlemagne, from which all distances in France are measured. The lines snaking into the cathedral, while long, stretching across the square to the street, moved relatively fast. Once inside the dark expanse of the cathedral itself, through the Portal of St. Anne, we shuttled along with everyone else, breast to back, very slowly making our way into the Nave. Less than an hour after we had arrived, we found ourselves almost unexpectedly seated, just five rows back from the Transept, among people from many countries, everyone in rapt attention, listening to our French priest begin Notre Dame’s Easter Sunday Mass. We had been told that Notre Dame can accommodate 10,000 people and Jacquelyn and I were convinced that there were at least twice that number that morning. We listened quietly, enveloped in the people, in the majesty of both the sweeping architecture and the lilting vernacular, and on this Easter Sunday morning we had no doubt that this was where God lived, right here, in this place, seated among us and the people of Paris. Mass ended too soon and through the maze of people we left Notre Dame through the Portal of Mary, Saint Denis staring down at us, head in hand. St Denis, Paris’ first bishop and patron saint, it is said, was one of the first Catholic missionaries to make his way to Paris. After much proselytizing, he was so successful at converting the people to Catholicism that the Roman priests had him beheaded as a warning to those who might forsake the Roman gods. It is said that once beheaded, St. Denis stood up, picked up his head, pausing to wash it off in a fountain, and walked to Montmartre where he chose to die. This “miracle” was apparently enough to convince the people of Paris, and Christianity soon came to replace the Roman gods after all. We stopped for lunch at a place near the Tour Saint Jacques where we experienced our only instance of ethnocentrism in Paris offered by a young waiter deriding my fledgling French and extolling his excellent English. He was quickly and thankfully replaced at our table by another waiter, and when we left we thanked him profusely for his graciousness. We walked to Shakespeare & Co., a bookseller of international fame, mostly, tourists that we are, so we could buy a Shakespeare & Co emblazoned copy of “The Little Prince” by Antoine de Saint-Exupéry. Perhaps most famous for her publication of James Joyce’s Ulysses, the bookstore was established by Sylvia Beach in the 1920s, and soon became famous as a meeting place for Paris’ literati. From the Hotel Pont Royal to the bookstore, we were once more following in the footsteps of Ernest Hemingway. The next morning was la café at the hotel and then back on the streets of Paris. As Frommer’s dutifully notes, Paris is made for walking. “Walking along the Seine, strolling around the Jardin du Luxembourg, or indulging in some idle flânerie (aimless wandering through an urban environment) along the Grands Boulevards will not only open your eyes to Paris’s charm and beauty, but will enable you to discover the city’s rich history.” Frommer’s is right. Walk the streets of Paris. Walk everywhere. No matter how far. You will not be disappointed. We headed back toward our hotel and strolled the periphery of the Musee du Louvre, just across the Seine from our room. Crowded, as always, we took pictures and asked others to take pictures of us, but decided against going in, the lines were simply too long. We chose instead the Musee D’Orsay, a former train station on the banks of the Seine, now outfitted with the works of Degas, Manet, Monet, Renoir, Van Gogh, Gauguin and Cezanne. While the main hall is not as intimate as we would have hoped, the accessibility and the sheer number of 19thand early 20thcentury works is nothing short of incredible. The Impressionist galleries, scattered randomly in Rooms 29-36, is something that must be seen. Built into the floor is a superb scale model of a section of the city with the 19thcentury Opera Garnier at its center. Toulouse Lautrec is here; Gustave Courbet’s L’Atelier du Peintreis here. Monet’s series of astounding paintings of the cathedral at Rouen are here. Rodin’s L’Homme Qui Marcheand his Gates of Hellare here; Manet’s scandalous-at-the-time, Le Dejuuner sur l’Herbeis here. Van Gogh’s Portrait de l’Artistand La Chambre de Van Gogh a Arlesare here. We stayed for hours, perhaps too long, luxuriating in every moment. 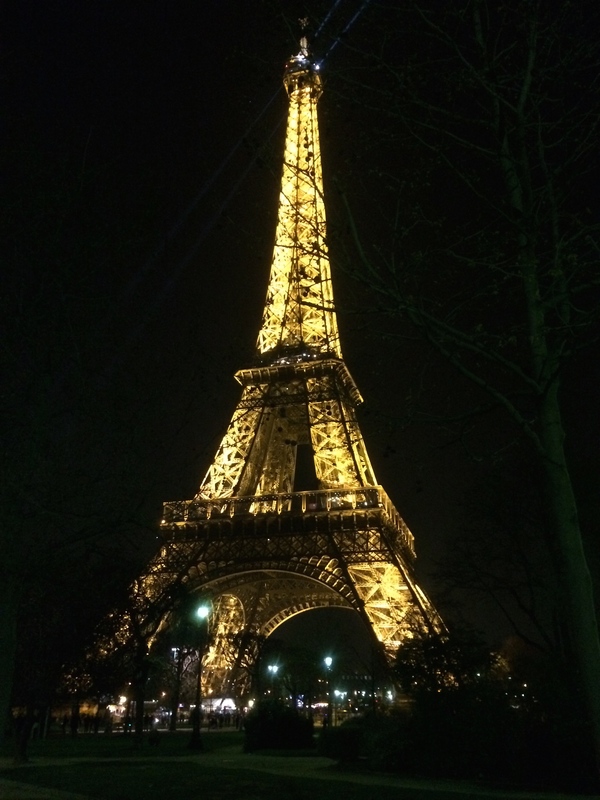 We had made prior arrangements at the hotel for dinner at the Eiffel Tower. Located halfway up the tower is Le Jules Verne, a restaurant accessed through a separate elevator, open only to those with reservations. We felt like very special guests, invited to attend a very special event. We ascended in the elevator, the staccato girders of the tower flashing dark then light and were seated with spectacular views, the maitre’d speaking fluent English, his last gig being at The Savoy in London. Around us were other guests. We listened in on conversations in five different languages. The menu consisted of soft-boiled egg with crayfish, green pea cream, crab and gold caviar, warm green asparagus from Provence, with a truffled mousseline, seared turbot, morel mushrooms and spinach with a Chateau-Chalon sauce, saddle of lamb cooked in a cocette with artichokes, and finally, a rhubarb and strawberry composition with chocolate and pralines. While the Jules Verne dessert lacked the sheer spectacle of that served at L’Atelier, we were having our marvelous dessert sitting in the Eiffel Tower while the bustling nighttime of Paris glistened around us. We walked home, both remarking how lovely it would be if this were our home, the cool Paris air warming our hearts. The next day, before we began our morning’s flânerie, my wife read of a small, bistro-style restaurant called Fish La Boissonnerie. We had the hotel call to make dinner reservations for us that night. Located at 69 rue de Seine, we arrived at the small, contemporary-styled bistro and soon struck up a conversation with the bartender. We decided to stay at the bar for our dinner, instead of a table, so we could continue the conversation. By happenstance we were introduced to the owners, Juan Sanchez and Drew Harré. We soon learned that they also owned another restaurant across the street called Semilla. Sometime later, following our trip, we also learned that they own both Cosi and La Derniere Goutte. Both of those restaurants are now on our list for our next visit. After describing the food at Semilla, the bartender at Fish graciously offered to make us reservations for the next evening, and we agreed. The next morning we wandered across the Seine through the Place de la Concorde along the l’Avenue des Champs-Elysees to the Arc de Triomphe Etoile. Construction of the Arc de Triumphe was begun in 1809 to honor Napoleon’s soldiers in their victory at the Battle of Austerlitz. Although it celebrates Napoleon, who died before its completion, his funeral procession, years after his death, following his exile to Elba in 1814, passed underneath it in 1840. The Arc now celebrates all French armies. There are places that seem to be institutions, even in Paris, and the Champs-Elysees is one of them. There are fancy restaurants, high-end fashion emporiums and one of the most profitable McDonalds in the world sitting astride the Champs-Elysses. Jacquelyn’s excursion to the “Mothership,” as she calls it, the flagship store of Louis Vuitton at 101 l’Avenue des Champs-Elysees, had to be on the list. Admittedly, from the 101 vintage trunks hanging from the ceilings to the Louis Vuitton museum on the upper level, it was indeed impressive; though frankly, we found the place to be a bit disappointing: the salespeople seemed to only grudgingly offer us any kind of service while the young Middle Easterners and Asians lounged in the store, obliviously playing games on their phones, surrounded by their multi-foot high stacks of recent purchases of LV bags, trinkets and paraphernalia. Back closer to home and away from the garishly conspicuous consumption, lunch was at Les Deux Magots at 6 Place Saint-Germain des Prés. According to Wikipedia, the restaurant received its name from a fabric and novelty shop close by at Rue de la Buci called Les Deux Magots de la Chine. It became a place of some historical importance as it catered to intellectuals such as Simone de Beauvoir and Jean-Paul Sartre. Albert Camus, Pablo Picasso, James Joyce and Bertolt Brecht were regulars. And again, while it was not intentional on our part, we were once more following Mr. Hemingway through the streets of Paris. Notwithstanding our disappointment with the Mothership, we ventured forth to the Louis Vuitton shop next to Les Deux Magots and there we found what we were looking for: amiable salespeople, helpful to a fault. The store was quiet and nicely appointed, at once accessible and pleasant. We browsed and talked with the sale people, finding the gracious assistance of both Xavier Bavay and Veronique Welter to be particularly notable. So, here’s some advice: if you’re in the market for Louis Vuitton, skip the Mothership. The smaller, more intimate Louis Vuitton shop next door to Les Deux Magots, personified by the excellent Mr. Bavay and the delightful Ms. Welter, has exactly what you want. An afternoon nap at the hotel was refreshing and as we walked on the rue de Seine toward Semilla for dinner, we considered stopping in at Fish to say hello, only to realize that the restaurant was closed for a private party. Disappointed but undaunted, we walked into Semilla, gave our names and were escorted to the only table that overlooked the kitchen. It was reserved for us with the script stating succinctly “Clark, 19h, 2p, t99” emblazoned upon a porcelain table card. We opened with a wonderful wine, Clot de l’Oum, some sparkling water and enjoyed what we look back upon as the perfect meal. The staff at Semilla, exactly like that of Fish, was enthusiastic, welcoming and friendly. We, again, felt like we were, if not royalty, then the cousins of royalty. Patrons among us were asking each other who we were; gesturing in our direction, one of the guests saying, “They must be someone.” And indeed we were. We were welcomed guests; the patrons of this magnificent restaurant. And there is no higher station. The food at Semilla was absolutely superb but was almost outdone by the wonderful staff. The chef, the bartender and the wait staff were so engaging and so absolutely delightful, we quite literally didn’t want to leave. We can do no more than thank Juan Sanchez and Drew Harré for creating those two gastronomic masterpieces, Semilla and Fish, in which Jacquelyn and I had two of the most wonderful meals of our lives. And to Julie and the staff of the Hotel Pont Royal and the wonderful people of Paris: thank you. Very much. We couldn’t have asked for more. Because of each of you our excursion, for it was nothing less, was absolutely wonderful. We will be back again. And again. “The Ballad of John and Yoko,” written by John Lennon, attributed to Lennon–McCartney as was the custom, and released by the Beatles as a single in May 1969.